In this multi-part article from Longwood Veterinary Center, your Kennett Square vet, serving Greenville, Chadds Ford, West Chester and surrounding areas, we will discuss keeping an indoor cat happy. There are some important things to consider before selecting the best scratching post for your cats. Does your cat like to scratch vertically (the arm of your sofa), or horizontally (the carpet or rug)? What type of material does your cat prefer to scratch on? What location in the house is he/she most likely to scratch? 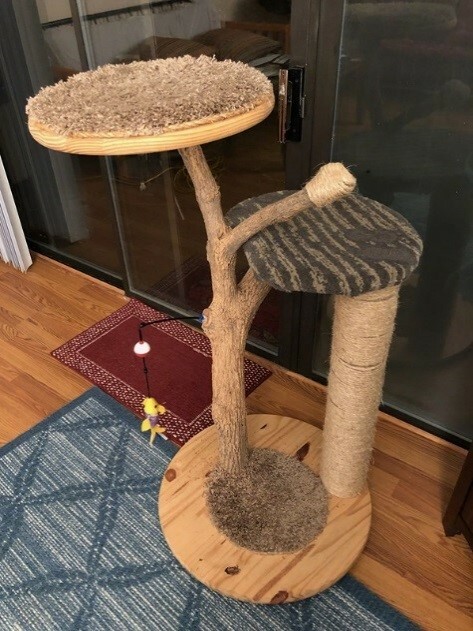 Vertical (upright) and horizontal (flat) scratching posts are available in a variety of sizes and materials including sisal (a coarse natural fiber), carpet and cardboard. Cats often scratch prominent objects near sleeping areas and room entrances, so consider placing posts in these “public” parts of the house. Due to scent marking, multi-cat households may need several scratching posts throughout the house. Use treats and/or catnip to encourage the use of the scratching posts you have in your home. If your pet does not like one option, try another type. If your pet has chosen an inappropriate item to scratch, cover that object with something your cat doesn’t like, such as double-sided sticky tape, aluminum foil, sheets of sandpaper, or a plastic carpet runner with the pointy side up. Trimming your cat’s nails will also reduce damage from scratching. Accustom your cat to having their paws handled and squeezed, by putting gentle pressure on the area and rewarding with a treat. Gradually increase the pressure and extend the claw. Continue with treats until your cat tolerates having his/her feet handled in this way. Using your cat friendly nail trimmers, cut the nail where it arches, and avoid the pink area, or “quick”. Cats are curious animals and love to know what’s going on around them especially if they are able to monitor their home from a safe, elevated spot! A perch provides them with an area where they can observe, relax, and nap in a protected environment. A perch is a must have in any kitty home. Some cat scratching posts come with attached perches. However, you may need to consider alternatives that are taller or located by a window for a more exciting and stimulating view. 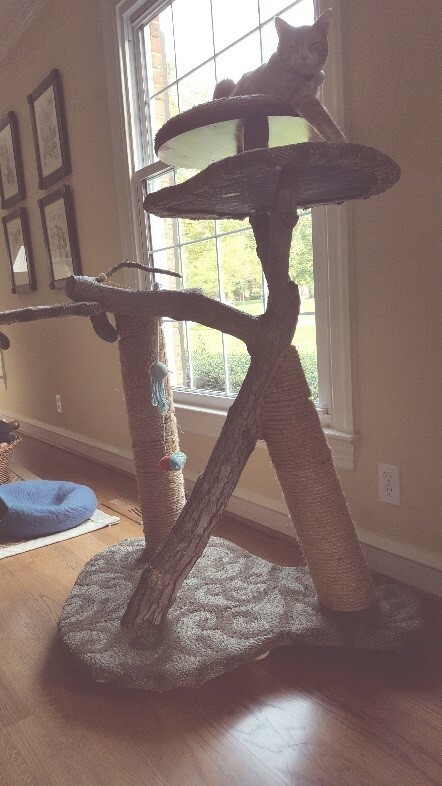 Perches and scratching posts are also a great spot to hide a few kibble for your cat to “hunt” throughout the day! 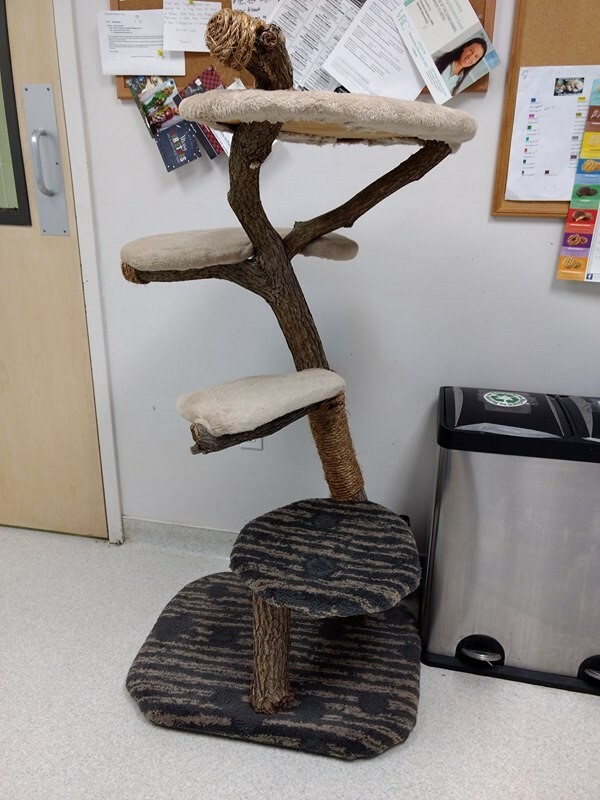 If you are interested in a custom cat scratching post, like the ones pictured below, contact Longwood Veterinary Center for more information.